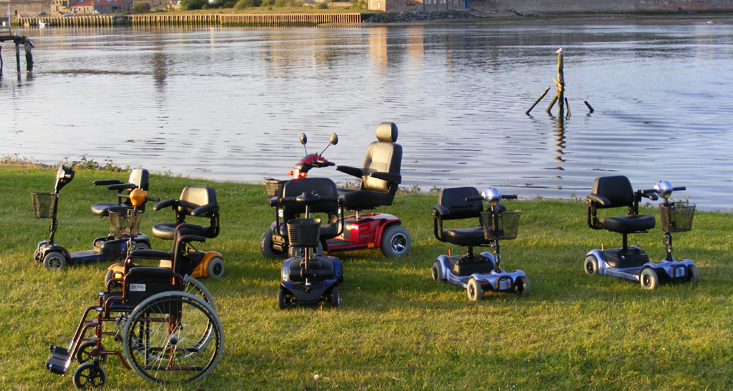 We have stocks of mobility scooters and wheelchairs for hire in Berwick-upon-Tweed, Galashiels and Edinburgh. All are available for immediate hire. All of our equipment is fully serviced by one of our trained technicians and fully insured for hire purpose through an independent third party. Our hire and lease policy is only available to the Northumberland, Scottish borders and Edinburgh areas. Prices are stated below, both excluding and including VAT. If the user is chronically sick or has a disabling condition, they may be entitled to VAT exemption. If this is the case, a quick form will need to be filled in upon payment and only the cheaper (excluding VAT) price will be payable. The 'per week' prices shown here for mobility scooter and wheelchair hire include free delivery to and collection from both Haven holiday parks, Haggerston Castle and Berwick-Upon-Tweed Caravan Parks. Other areas of Northumberland and the Scottish Borders are available for a delivery and collection service but may incur a small charge. If you are requiring hire in Edinburgh or Seaton Sands Holiday Village the below pricing is applicable. The weekly prices includes delivery and collection within the Edinburgh area and Seaton Sands Holiday Village.